We heard some people were skiing yesterday. This meant short lines and few people on the snow shoe trails. The snow was deep and a bit isothermic but we shred it nonetheless. 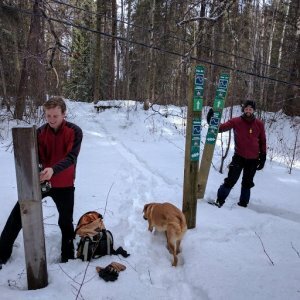 A few volunteers wrestled a few 8 foot sign posts into the Moonrakers around Sander Lake and the Canyon. 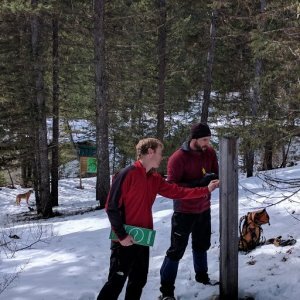 We changed out a few signs and marked a few new short trails. What’s this all about? Private Lands Trail from the Canyon to Sander Lake is now called Wapti Ridge. There is a short East West section joining Klahowya and Wapti Ridge close to the top of Sternwheeler. It is still signed Private Lands Trail. Klahowya running from the Kiosk at Canyon Creek is now marked as a blue trail. It is also shown on the maps this year as extending from the Canyon all the way back to Sander Lake. This replaces the Ptarmigan Trot trail on the West side of the lake. 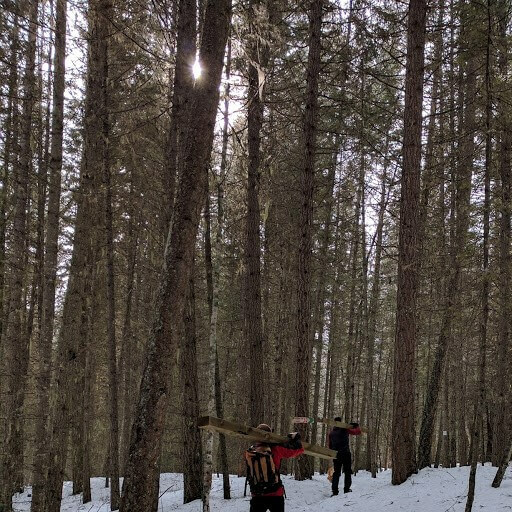 We carried sign posts in for a new short trail connecting Klahowya and Wapti (new versions) about 500m South of the South end of Sander Lake. This trail will allow users to loop back to Sander Lake or to Sternwheeler quickly. We also removed Windigo Chute and Kissime lookout from our inventory of trails this year and will not be maintaining these trails. We took down the signs.